WELL, they’ve all gone off on their hols with homework set by their dear leader Kim May. She’s told them to reflect on the error of their ways and come back, if not refreshed, subdued and ready to vote for an even worse Withdrawal Agreement than before. One, her silent threat is, that will only get worse with McMarxist’s helping hand. That it is she who needs to do the soul-searching, and acknowledge the terrible responsibility she bears for the pass she has brought the country to, I doubt has even crossed her strange, stubborn and constricted mind. No, we do not expect her to be writing her final statement over Easter. So instead of putting their feet up, Brexiteer MPs should prepare for more chicanery, not least how she will use and abuse the extension timetable to avoid the EU elections, whether not she has an agreement with Labour by May 22nd. There are no depths to which her government will not sink. The latest example of their chicanery to come to light was the Treasury’s scuppering of Sajid Javid’s perfectly good plan to solve the Irish backstop problem. They chose to block something that would have vastly improved Britain’s negotiating position on the backstop. The Home Secretary had, it is now reported, commissioned Border Force officials to work up a plan using Swiss-style technology to manage trade and tariffs to avoid a hard border in Ireland – something David Davis, the former Brexit Secretary, has long since argued was entirely feasible and was the solution. Why Mr Javid did not resign when his plan was so summarily dismissed is another question. He should have. And that he didn’t takes us to the heart of the problem: while he and his colleagues seem so unprepared to relinquish their cars, whatever the next enormity to come from the Treasury or Number Ten, leaves Kim May invincible. The latest polls should, at least, be a wake-up call. Yesterday’s YouGov survey put the Tories on 28 per cent if a general election were held tomorrow, down four points since the start of the month. · Conservative support plummets to lowest level in five years. · Conservatives drop 6 points in two weeks, granting Labour a 7 point lead. · Only 17 per cent who would vote in European Parliament elections would choose Conservatives. 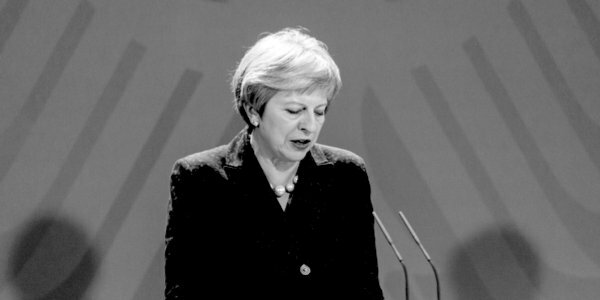 · Theresa May’s lead over Jeremy Corbyn as to who would make the best prime minister also falls. What’s clear is that the Conservatives have no future as a party while Mrs May remains their leader. We at TCW are counting the days it takes for them to get their head round this fact and topple her. Today is Day Ten . . .